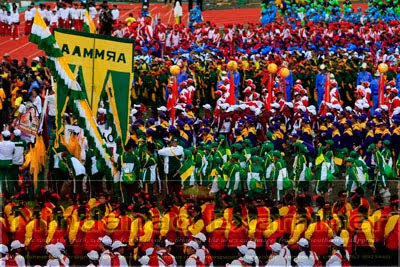 Delegates to the Palarong Pambansa in Dapitan City in the southern Philippine province of Zamboanga del Norte parade during the opening ceremony of national sports competition. Vice-President Jejomar Binay together with local officials led by Zamboanga Norte Governor Rolando Yebes, Dapitan City Mayor Dominador Jalosjos and former Zamboanga del Norte Representative Romeo Jalosjos lead the opening ceremony. (Mindanao Examiner Photo - Mark Navales). 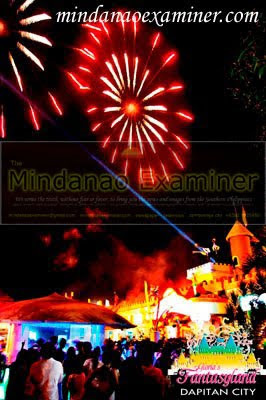 DAPITAN CITY, Philippines (Mindanao Examiner / May 8, 2011) – The Shrine City of the South, Dapitan in the Philippines' Mindanao Island, formally opened Sunday the much-awaited Palarong Pambansa as athletes all over the country compete in the grand sports competition. 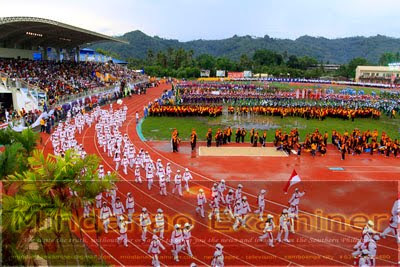 Some 30,000 athletes and spectators flocked to the Jose Rizal Mindanao State University Sports Complex and were greeted by wild cheers from local well-wishers and organizers of the event as they paraded their colors representing various regions in the Philippines. 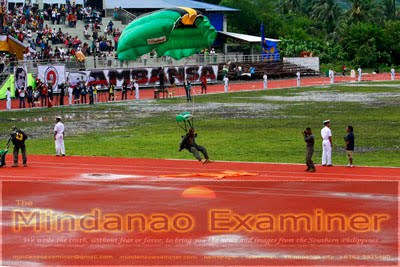 Philippine Army parachutists led by Colonel Eliglen Villaflor also showed their talents and skills and added more colors to the already colorful sports competition which coincided with the month-long Hudyaka Festival which is one of the most awaited tourism events in the whole of Mindanao. 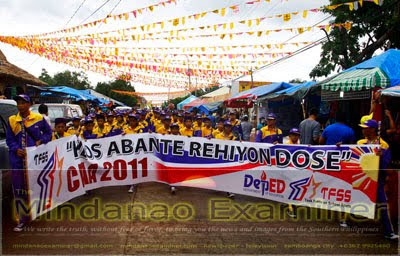 The opening ceremony was graced by Vice President Jejomar Binay, who was the keynote speaker, and local and provincial officials headed by Dapitan Mayor Dominador Jalosjos, Governors Rolando Yebes, of Zamboanga del Norte; Rommel Jalosjos, of Zamboanga Sibugay, Education officials Teofila Villanueva, of Region 3 and Walter Albos, of Region 9. Local Councilor Apple Marie Agolong, who heads the event promotions, said thousands more are expected to arrive in Dapitan for the twin event.